Every year we see more reports and forecasts urging manufacturers to do something about the skills shortage. It’s time for us to do our part and we want to empower you to keep manufacturing alive and well in America. It starts with the youth. We stopped engaging with younger generations and we stopped sharing our technological advances in the machine tool world. As a result, most millennials think manufacturing is a dying industry. They have no idea how many amazing opportunities are available for them to become engineers, programmers, product managers, marketers, and the list goes on. In order to transform our industry’s reputation, we need to work with schools to show students what modern manufacturing really is. In December, we did just that. 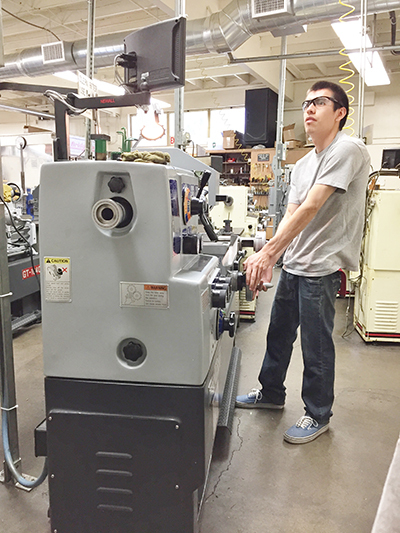 We donated our robust GT-1640 lathe to Simi Valley School and Institute to support their machinist training program. “The GT-1640 is ideal for this type of work because it is a powerful and precise lathe. It is also the type of machine students can expect to see when they enter the workforce,” said Simi Valley Lead Instructor Oygar Lindskog. >>Read the full story here. While it may seem like giving away a machine is a big chunk of change, we know it will pay off in the long run. It’s our contribution to educating and invigorating people so that manufacturing continues to grow and thrive in America for generations to come. As passionate manufacturers, we want to see our industry grow and help incoming generations succeed. Let’s work together to make that happen. ganeshmachinery.com | 818.349.9166 | Copyright © 2016-2018 Ganesh Industries, LLC & Ganesh Machinery. All Rights Reserved.